Mount St. Helens is an active volcano located in the Cascade Range in Skamania County, Washington in the Pacific Northwest region of the United States. It is well known for an eruption that occurred in 1980, which was the deadliest and most economically damaging volcano eruption in the history of the United States. Fifty-seven people were killed, along with approximately 7,000 big game animals and an estimated 12 million fish. The eruption also caused significant damage to the area, including the destruction of 250 homes, 47 bridges, 15 miles of railways, and 185 miles of highway. The events that led up to the eruption began on March 20, 1980, when Mount St. Helens experienced a magnitude 4.2 earthquake. On March 27, steam began venting from the mountain. By the end of April, the north side of the mountain had begun to bulge. Shortly after 8:30 on the morning of May 18, a second earthquake occurred, measuring 5.1 on the Richter Scale, which triggered a collapse of the north face of the volcano. The volcano experienced an explosive eruption, with magma from the volcano flattening forest and buildings over a 230 square mile area. The eruption ejected more than 0.67 cubic miles of material, and reduced the mountain's height by about 1,300 feet. It left a crater 1 to 2 miles wide and 0.5 miles deep. 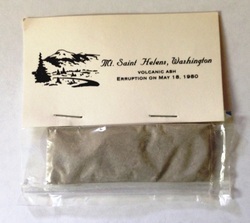 The item in my collection is a small packet of ash from the eruption.